Two fish processing plants — TT Cold Store Factory and A&N Foods (Myanmar) Co. Ltd — have been granted permits to export fish caught in the wild to the European Union, according to a report by state media. 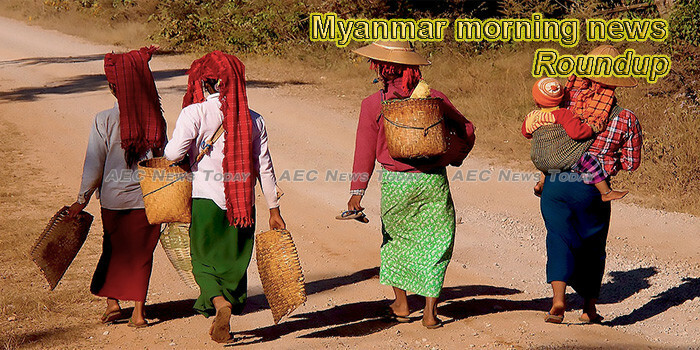 Myanmar’s Yangon Region Investment Committee (YRIC) has permitted a total of 43 foreign enterprises with 56.2 million U.S. dollars’ investments as of Jan. 9 in present fiscal year 2018-19 which started in October, the official Global New Light of Myanmar reported on Thursday. The US dollar has been sliding against the Kyat in the local currency market, with the exchange rate touching a low of K1,533 per dollar yesterday, a decline of K9 from 2 January, said money exchangers. Rohingya Hindus, who sought refuge in Bangladesh, want to return to Myanmar but are not being allowed by Bangladesh officials, American daily Los Angeles Times reported. The construction of a new road and bridge near the existing Goke Hteik railway viaduct in western Shan State will begin this year, the Ministry of Construction has announced. Melon growers from Myanmar gave away some 50 tons of watermelons last Monday, in a protest against the closure of a key border checkpoint for fruit exports in the Muse border trade zone on the Myanmar-China border. It’s just a month old, but a new Instagram account is doing its best to tap into the historical imagination and nostalgia of Myanmar’s social media-savvy youth — and it’s already got our attention. China’s attempt to cut the funding for a United Nations evidence-gathering mechanism tasked with investigations on Myanmar’s international crimes has failed as the UN finalises the budget. A busy border crossing at Muse in the northern Myannmar state of Shan has been closed since 27 December, causing hardship for fresh produce and seafood traders. OUE Lippo Healthcare (OUELH) is venturing into Myanmar with stake acquisitions in two joint venture companies that own three hospitals, one medical centre and two clinics. This will give the company presence in the key cities of Yangon, Mandalay and Taunggyi, the subsidiary company of OUE Limited said on Thursday. The European Union on Thursday condemned an escalation in violence in Myanmar’s restive Rakhine state that has led to the displacement of around 4,500 people. U Min Thu, minister for the Office of the Union Government, has urged General Administration Department (GAD) staff to change their mindset and shed old habits when carrying out their duties, according to the Ministry of Information. Myanmar will launch Mekong-Lancang Cultural Exchange Youth Camp with the use of Mekong-Lancang Cooperation Fund, aiming at enhancing cooperation between cultural groups and youth artists from six Mekong-Lancang countries, Myanmar News Agency reported on Thursday. Visakhapatnam: Gold biscuits worth Rs 1.09 crore smuggled from Myanmar has been seized from two train passengers at the railway station here, the Directorate of Revenue Intelligence said here on Wednesday. As lawmakers consider changes to labour laws, workers go on strike for a second time in six months at a Taiwanese-owned shoe factory in South Dagon. President U Win Myint received the outgoing Ambassador of the Lao People’s Democratic Republic to Myanmar, Mr. Lyying Sayaxang, at the Presidential Palace in Nay Pyi Taw yesterday. The Pride of Myanmar awards has been conceived by a group of like-minded people who believe that there are stars in Myanmar in fields including but not limited to the entertainment industry who need to be recognised on a national platform. So the team created an awards platform that discovers, recognises and promotes these budding and thriving talents who have not just made their mark nationally but on a global platform as well. Rakhine State government municipal minister Win Myint said that some money from the Rakhine State Disaster Management Fund would be spent on internally displaced persons (IDPs). Geneva-based International Committee of the Red Cross (ICRC) has been providing assistance to newly displaced civilians as fighting intensified between Tatmadaw (Myanmar military) and Arakan Army (AA), after the latter attacked police border outposts on Independence Day.